Do the rovers in Hayabusa-2 communicate directly with the spacecraft or use the landers as relay? Do the ROVER-1A and ROVER-1B communicate with MINERVA-II-1, and it then relays to the Hayabusa2 "mothership", or do they communicate with it directly? Is the same valid for ROVER-2 and MINERVA-II-2? The information on EOportal for MASCOT is pretty good, since it even goes into details enough to say that it uses CCSDS TM and TC standards, which is the kind of information that I was looking at for the landers. I am fairly certain that what you are referring to as the "landers" are actually just cases for the rovers. MINERVA stands for "MIcro-Nano Experimental Robot Vehicle for the Asteroid". Note that its name only talks about rovers. If you take a look at this picture (courtesy Sky and Telescope Magazine), you can see that the rovers are contained within a more or less empty shell. 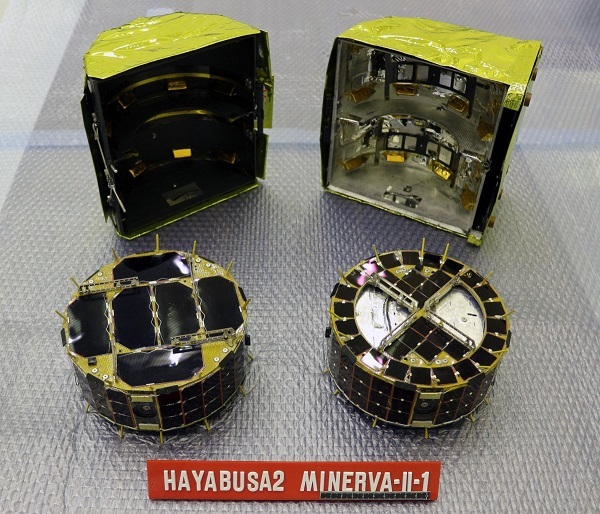 Communications with the Hayabusa spacecraft are accomplished at data rates of up to 9,600 bits per second. Based on this and other pictures I found, I think it's safe to conclude that the rovers will communicate directly with the spacecraft, not with any lander. On a side note, I found a scientific paper discussing the mechanics of how the rovers will get around by "hopping" on the asteroid's surface. Not the answer you're looking for? Browse other questions tagged communication lander standards hayabusa2 or ask your own question. What type of onboard radar did the Surveyor landers use? Do lunar landers communicate with ground stations during descent and landing? How do non-Earth-facing vehicles communicate with Earth? How are the tiny spacecraft proposed by Project Starshot supposed to communicate with Earth? How do landers communicate with Earth when facing away? Is it possible to use the planet earth as a giant smoke signal to communicate across space?